You can enjoy a HoMedics cushion based on the number one style of massage in the United States in the comfort of your own home with the HoMedics Swedish Massage Cushion with heat. This is a great way to relax after the stress of a long day! This also makes a great holiday gift for almost anyone. The HoMedics Swedish Massage chair has state of the art moving massage mechanism with three customizable programs. Bonus: Facebook Fans can save an additional 10% off their HoMedics Order. Do you want to relax at home? One lucky winner will win the HoMedics Swedish Massage Cushion with heat. 1. Leave a comment with how you relax. Giveaway ends Monday, November 15, 2010 at 3 p.m. EST. Winner will be chosen by random. Be sure bargainbriana@gmail.com is in your safe sender list as you don’t want to miss the email if you are the chosen winner. 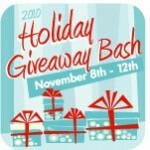 This giveaway was sponsored by Homedics as part of Holidays Win Giveaways Bash. This Post was written by me and was not edited by the sponsor. Read more on my Disclosure Policy. Find more information on the terms for this giveaway on the Win Giveaways Facebook page. Check back everyday throughout the day for more Giveaways! Good Luck! I relax by getting a mani/pedi. nice, warm tea and a book is my way. watching a decorating show with my daughter …..
i am also a FB fan! i relax with wine and movies! I follow via RSS feed! I relax with a bubble bath and my favorite music! I relax by putting on my pajamas and reading. One of the most relaxing things to me is a nice back scratch/rub. I find a cold beverage in the hot tub with my hubby! I don’t. lol. laying in bed is best! I subscribe to daily emails. Massage is a FABULOUS way to relax! Have husband give me a backrub!! I follow on twitter @rowynyew and tweeted the above message! I like to sit back and play poker after a long day to calm my nerves and ease the stress or sometimes a nice relaxing bath! I have a wonderful husband who rubs my back every night (Im 8 mos pregnant), this would save him a lot of energy!!! My relax is a hot bath for 1 hour! I love a nice bath with a book. I love to read a book to relax. I like to relax by cuddling with my husband and watching a movie. I crochet to relax and unwind. I relax by reading a good book when I’m all by myself. Relaxing for me is reading in the tub. I like a nice massage and some tea. I love to ask my husband for back rubs. I also try to take a bubble bath at least once a week. I like to read a book while enjoying a hot cup of tea. Relax? What does that mean? Seriously, I usually just lose myself in a good book. I relax by closing the door and laying on the bed with arms spread wide in complete and total silence…. I relax emotionally by playing the piano, but I relax physically by resting on my couch and watching tv with my husband. I’m an email subscriber to this blog. I like Bargain Briana on Facebook. My FB username is Shawna OBrien. I relax by getting a back, neck or feet rub from my husband. I liked you on face book! i would love this! i have the tightest body and this would help me relax! I relax by getting online! I am a liker on FB. warm bubble baths are a great relaxation! I relax with a good book, hot cocoa and a cozy blanket. Relax? What is that? :) thanks for the chance. I subscribe with MyYahoo reader. I subscribe to your email. Thanks! I follow you on Twitter and tweeted. Thanks! I relax by reading a book. Hot bubble baths with music and a locked door to keep out the husband and 4 children! My last one just died since I use often. I would love to have a new one. I like to sit down in a comfy chair and read a good book with classical or jazz music playing. Great giveaway, thanks. I’m a liker of Bargain Briana on FB! Clearly I don’t do it much LOL This would be great for me. I relax in a lot of ways, but my favorite is in a bubble bath with a good book. Sleep in while my husband watches my daughter!!! I love relaxing by the fire with hot chocolate and a good book! i want this ONE for myself! I relax on my hour lunch break by doing something I want to do…mainly shop! I just like to sit in the quiet when everyone is in bed. A good read and/or a pedicure! This would be a great gift for my husband. He is a DV and has a bad lower back. I like to watch tv to relax. I relax when my kids are in bed and have some ME time. A nice, long bubblebath at the end of a hectic work week relaxes me best. I love to relax at the beach, unfortunately can not do that often, so I take a nap!! I like to relax in the bath. I relax by drinking a cup of hot tea and doing one of the following: read a magazine, write a letter, or quilt. My relaxing moments most often happen in our deep soaking tub. A hot bubble bath does wonders! One way I relax is with a nice warm bubble bath. A massasge from my Boyfriend! I subscribe to BB emails. I like to snuggle in my chair and relax with a movie or show after everyone is asleep. I put on some Sade…light some candles…and take a nice bubble bath! I relax on the sofa watching tv after the kids are in bed…boring but great for me! My relaxing is with a starbucks frappucino. I relax with a cup of tea and a good book or a bubble bath. I like to take a long hot bath! I relax in my recliner with a throw, my dog and a book, tv or computer… sometimes all three. Hi! With a 4 yr old and a 9 month old I don’t find much time to relax! The massage cushion would be great to have and help me unwind! Thanks!! I have you on my RSS feeder. I love a long, hot bath and a good book! I relax by laying my head on my favorite pillow, on my couch in a cool living room and listen to soft music as I drift off to sleep. Tea and a good book or magazine. Or ideally with a nap, but that isn’t always possible. I posted a tweet about the giveaway on twitter. I am a fan of bargain briana on facebook. I relax with a good book and a cozy blanket. Although it’s hard, I try to take an extra long hot shower, because I would never have time for a bath! I subscribe to you on facebook. I take a long hot bath to relax!! With a good book, a warm blanket, and a cocktail. It doesn’t get much more relaxing then that! I relax by taking a hot bath with lavender oil and soft music. I love to read a magazine to relax. I relax on the couch with my hubby after a long day! I relax in the bathtub with epsom salts and oils. I follow you on a Yahoo RSS reader. In my La-Z-Boy with my feet up! I relax by curling up in my favorite chair and watching some TV. I love to snuggle up on the couch with my cat,a mug of hot chocolate with extra whipped cream and watch a movie on Lifetime Movie Network!! with wine, my hubby and the couch!! I tweeted, yes I did! I relax by taking a long hot shower after a long day! I relax by taking a hot shower, getting into clean jammies, and watching a movie with my honey. I like to relax with a cup of tea and a good book. Thanks for the chance. I subscribe to emails & I can’t remember if I entered this because I was having trouble w/my computer. I would enjoy using this gift because it will help my back. I subscribe via RSS Google Reader. I am a facebook liker of your page. How I relax: A bubble bath and a good book. I relax in a hot bathtub with a good book. I relaxer by sitting at my computer checking email or facebook. My favorite way to relax and laying with a comfy blanket, a candle burning and a good book or magazine in hand! A hot cup of tea, a good book in a quiet house. I relax in my big purple chair! I tweeted this great giveaway`snjhousewife! I ‘like” you on fb! My Favorite way to relax is to actually have a weekend getaway at the spa, but since that is rare usually, just getting 15 minutes to myself helps!! I shared the HomeDics Swedish Massage Cushion giveaway on Tweeter again today. I am so excited about the contest. I relax by taking a long bath ALONE! :) No kids! I relax by sitting down to watch one of my favorite shows on tv. I am a email subscber. I relax by getting out of the house alone. Napping is usually my only way to relax. I love to get a massage from DH, so maybe this would be my new way if he’s not available! I relax by reading at night right before bedtime. I relax with a book and a bowl of ice cream! Taking naps is my favorite way to relax. I would sit on the beach with my feet in the sand if the beach were closer to Kentucky!! With two little ones, it’s hard to find time to relax. I generally get in comfy clothes and lounge on the couch, but if I really want some time alone I’ll watch a movie in my bedroom to get away! A lovely glass of wine!! I relax by taking a long slow stroll around the lake on my horse. I relax with a book and a bath. When I can’t take a bath I invite my 5 year old daughter to do my hair and nails or allow my son to use my legs as racetracks- these things are always relaxing too! At 38 weeks pregnant, just finding an actually comfortable position on the couch is good enough relaxation! I read but I think it would relax me even more if I was sitting on one of these reading! Sounds nuts, but cutting coupons is relaxing to me. I am subscribed through google reader! I snuggle with the hubby on the couch… kidless time is priceless! On the weekends I try to let myself be lazy for an hour each day. I get a monthly massage from a professional for an hour and a half! I like to a shoulder massage from my husband, to relax. I receive your email subscription. A massage or a hot bath. Both of which sound really good right now. Playing xbox helps me unwind. Love to just sit outside (weather permitting) and take it all in. a Facebook Liker of Bargain Briana on Facebook. A cup of hot coffe and an episode of “The Andy Griffith Show” is how I relax… and sound REALLY old! I usually relax by sitting on the couch with a couple of dogs, maybe a cat or two, a warm blanket, a cup of tea and a good book! I like to read books as a way to relax. relax? with kids? hmmmmmmmm send them to grandma’s? With 3 kids I don’t get to relax. I would love to give this to my mom who has fibermyalgia. OOOOOooohhhhhhhhhhhh I would LOVE LOVE LOVE this! like you on FB! You were actually the very first bargain site I found, now that’s all I use my fb for!! I relax most of the time after dinner, by watching my favorite shows on tv. This would help me relax even more I’m sure!! I relax by reading a good book. I relax by reading a good book before bed. I like to relax by drinking a nice cup of hot tea. I relax with hubby on the couch. I relax by playing with my two dogs. I am an email subscriber. Hot bath and music, but I would love to try this!! I relax by reading books. Have hot tea and watch a movie. I like to relax with a book and a hot cup of tea….and chocolate is always a lovely addition. I relax by taking a long hot bath. I like to relax by either sleeping, or sitting down with a good book. I relaxing by laying down and reading a good book. I relax with a hot bath. Relaxing time is hard to find with my family of 5, but I love to just sit on the couch and catch up with Young and the Restless, or watch a great movie with my family! I relax with a nice quiet walk around the block or down to the pond in my neighborhood. Massages! And this would be a great way to save money on Massages! I relax by curling up with a good book. I’d love to win! I relax by watching one of my favorite shows– The Andy Griffith Show. My most favorite way to relax is to get into my PJs, climb into bed, and read a book. I play video games to relax. I relax with a bubble bath and quiet time. When I want to relax I grab a book and crawl into bed. I drink my wine to relax. I tweeted this post on twitter. when I am stressed I play on the computer to relax. I like to relax with pedicures every other Friday. I find it a nice way to wind down from the week. I usually relax in unhealthy ways–such as with a glass (or two) of wine. Help me out! I take a nice long bath when my girls go to bed! I love to relax with a good movie , hot coffee and warm comfy blanket. I subscribe to your feed through Google Reader. I love to relax in a hot bath with a book!! With a nice cup of coffee in the morning…and sometimes I love to throw on a movie and relax after the kids go to bed. My favorite way to relax is with a good bubble bath! I like ot relax with a nice long bath, and reading while in there. I relax with a nice glass of wine, smooth jazz and my sweetheart by my side! I relax by handing my husband our daughter and getting out of the house for a while. I’m a subscriber…..what a wonderful welcome this item would be!! I love to relax by reading and crocheting. But, sitting in one position for an extended period of time makes my back and shoulder hurt. My favorite ways to relax are to read and crochet. But, sitting in one position for an extended period of time hurts my back and shoulders. My kids give me mini massages! Taking a hot shower and then reading a book is the MOST relaxing thing to do when you have 3 kids! I relax with a hot bath and a good book. I like a hot bath! I relax in a nice bubble bath! My relaxing time is between the kids going to bed and my husband coming home from work. I try to have all my work done by then, so I can just sit and watch something in peace! I like to read to relax. I go outside. That way I don’t see all around me the things on I have yet to accomplish. The outdoors also keeps things in perspective for me. I also ‘like’ you on facebook and posted about the giveaway. Definatley a hot bath with soft music and candles!!! I relax with a book – or my scrapbooking! I relax with a hot bath and a book. I take a nice long hot bath to relax. The only time I relax is when I get a massage…so this would be great! I like to relax with a bubble bath, candles, and a book. Relaxing for me is having some quiet time snuggled up with a book! I also follow you by email. I relax with a massage and some good music. I follow you on facebook, thank you. i like to relax by watching tv. I actually do not get time to relax except when the kids go off to school and i usually get on the computer. I relax by working out or hanging out w/ friends. Who gets a chance to relax:D When I do I like to sit and watch a movie with the family and cross stitch. I actually relax on the computer! A massage cushion would be great! I take a long hot bath! I like to relax by reading. This would be great to win — thanks! Reading a great book is my favorite way to relax. Since my favorite genre is suspense, I don’t know how relaxing you can call it, but, hey, it works for me! Read you daily via RSS to my Google Reader. My mom sat in one of these at Sam’s Club over the weekend – she loved it. Winning this would really help out my Christmas budget! I relax by taking a long hot bath. I am a fan of Bargain Briana on Facebook. I like to relax reading. relax with a cup of cocoa and tv! I relax with a cup of coffee my feet up playing games on facebook. I like to be able to sit down and watch a movie with my family. I like to relax with my laptop and dvr recorder during my kids nap time. umm I rarely do! this would be great!! I take a hot shower to relax! I love a hot bath to relax. A hot bath is always relaxing. I read or listen to music to relax. I relax with a sweet movie with my husband and kiddos!